A brilliant Merlot-dominated Bordeaux blend showing red berry fruits, chocolate notes and a certain, spicy earthiness. John Xavier Merriman, a South African Prime Minister in the early 20th century, bought land in the Stellenbosch region in 1892, which became the beautiful Rustenberg Estate. 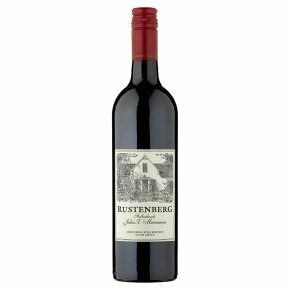 Try this rich, ripe, elegant red with roast meats. Wine of Simonsberg Stellenbosch, South Africa. This blend of Merlot, Cabernet Sauvignon, Malbec, Cabernet Franc and Petit Verdot was cask-matured for 20 months. Plum and cigar box aromatics prelude a multi-layered palate with elegant tannins. This wine will benefit from maturation in ideal cellar conditions for the next 8-10 years. The label commemorates the custodian who lovingly revitalised the farm during his ownership.